← The ‘Ray Donovan’ Rumpus? It Ends Tonight! After last week’s upsets, injuries and shoe-sole theatrics, will the ball keep bouncing funny? If you love Andy Murray, Novak Djokovic or Serena Williams, admit it: You’re nervous. You just can’t shake the feeling—maybe you’re starting to sweat—that Wimbledon is about to get weirder. 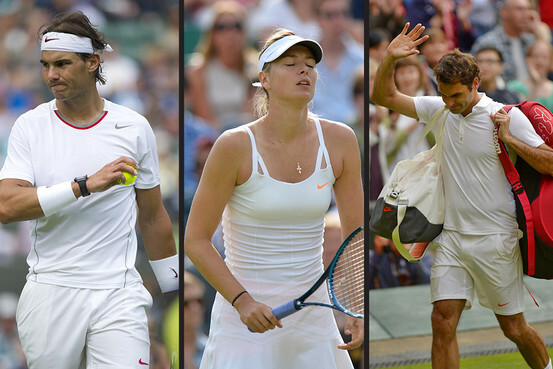 The first week at the All England Club was among the strangest the tournament has seen. Defending champion Roger Federer was told to keep his orange-soled shoes off Wimbledon’s precious lawns. Players slipped all over the grass and hurt themselves: 13 either retired or withdrew from matches, tied for the most ever in the Open era at Wimbledon. Old age was an asset: Nine players 30 or older reached the fourth round, tying an Open-era Wimbledon record set in 1975. And of course, there were upsets—the kind of spectacular upsets that used to be more common in tennis, but that have become rare in an era of dominant champions. Federer and Rafael Nadal both lost to unseeded players. Maria Sharapova, seen as one of the few women who could contend with Williams, was quickly rendered a spectator. Strangest of all, of course, would be a takedown of Williams. She hasn’t lost a set so far and mercilessly battered Kimiko-Date Krumm, a 42-year-old, 6-2, 6-0 on Saturday evening. Williams loves Wimbledon, where she has won five singles titles, and says she feels like she’s just starting to peak. But there are two women in this tournament who could stun Williams, under the right circumstances. Her next opponent, Sabine Lisicki, is one of them. Strangest of all, of course, was the takedown of Williams by Lisicki. A classy affair, all the way around. This entry was posted in Uncategorized and tagged Maria Sharapova, Rafael Nadal, Roger Federer, Sabine Lisicki, Serena Williams, Wall Street Journal, Wimbledamus, Wimbledon. Bookmark the permalink. Told to zip it, I went back to finishing my Postum and the rest of the paper. Hang on to your Postum, Mike. There’s more to come we’re betting.